You aren't really anybody in America if you're not on TV. 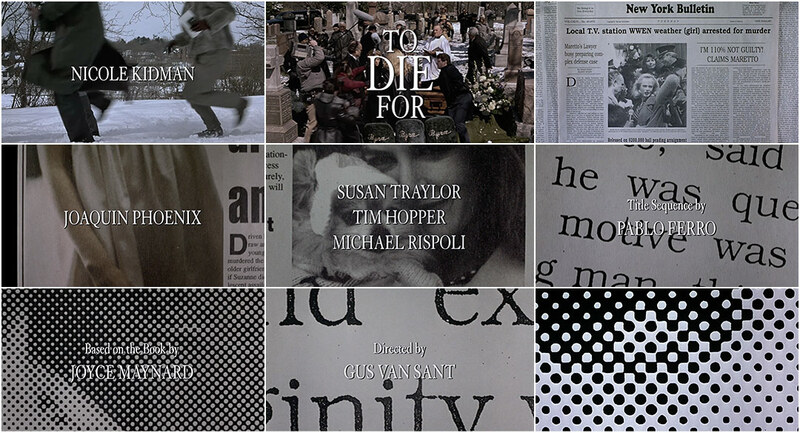 Title Designer PABLO FERRO and his son ALLEN FERRO discuss the opening of To Die For. Allen Ferro: Laura Ziskin originally brought Pablo in to do To Die For. Gus [van Sant] fell in love with his artistry and the way that they work together is very good. Pablo Ferro: Yeah, the To Die For film was in trouble. The audience was confused about [Nicole Kidman's] character. Allen: We went in and re-edited the main title sequence and Pablo came up with a wonderful design for the main titles. Pablo: Well, they realized they needed a sequence to get to know the main character, who she is, so I said OK and we did it through magazines and newspapers and things like that. The artwork is a circle to the picture to the dots. We did it on the computer. It looks like one piece of art but it was many pieces! Allen: He had some of the people who were at [Title House] actually do articles – write articles for the story. Pablo would just basically tell them the basis of the story and they would go ahead and write long articles. You could actually read them! Pablo: Right. I got this friend of mine, Daniel Zuber, we did a script together. I said, “Look at this film and I want you to write a description of the entire film." And he did and he wrote the whole thing! Allen: Daniel and Pablo had a very good time creating the articles and their headlines. When you watch the movie, one can freeze-frame some of the articles and read them. They are quite hysterical. Pablo: So by the time we get through the titles, everybody in the audience knows who she is. After we did that, they tested it again with an audience and it got a very high score. READ MORE about Designer Pablo Ferro in our feature article Pablo Ferro: A Career Retrospective. KEEP ART OF THE TITLE GOING. BECOME A PATRON TODAY.